Koi fish have been fascinating creatures to keep for many years and can display some wonderful colourations. They can fetch large prices for the quality strains and there are many Koi keepers who regard them as their prized possessions. Keep reading for everything you need to know about Koi fish care! This article is a guest post by Jan from Aqua-fish.net! The name “Koi” is actually an abbreviation for “nishikigoi”, which can be translated into English as “brocaded carp”. Koi fish are direct descendants of the common carp but through selective breeding are now classed as a species in their own right. They are not classed as aquarium fish but are as ornamental pond fish; they are relatively hardy and live for many years growing into large specimens as they mature. Originally the carp were only to found in Europe and Asia but since they were domesticated in Japan, populations exist worldwide as they can adapt very well to different climates. It was in the 1820’s that the carp were selectively bred for their colouration and in the early 20th century this practice became more and more widespread. Although Koi and goldfish both descend from wild carp (common and Prussian carp, respectively), there are visible differences between the two species that are obvious even to novice fish keepers. Koi carp almost always have the same body shape and finnage, with goldfish the body shape and finnage will vary greatly, especially with the selectively bred fancy goldfish. Koi fish also possess barbels near their mouths. These are not always visible when they are juveniles but soon become apparent as they mature. Koi and goldfish can be housed in ponds together and have even been known to interbreed. However, the offspring are always infertile and a new strain from mixed parents cannot be established. Varieties of Koi’s are listed on Aqua-Fish.net! Koi fish have several requirements for a long life even though they are classed as hardy fish. Meeting these requirements when your Koi fish pond is first designed will save a lot of heartache at a later stage! Koi are a very active species unsuitable for your home aquarium: Koi ponds can be 1000’s of gallons with the minimum at around 500 gallons (1890 L) per fish. Filters are very large as well to keep up with the carp’s waste production and require regular maintenance and cleaning out. Koi appreciate plenty of water movement in the fish pond; often you will see Koi ponds with corners that are slightly rounded. These are to prevent any dead spots and to keep the water flowing freely. If a pond liner is being used in your fish pond rather than cemented walls then make sure that any of the corners are well tucked and tidy, as these can also affect the water flow if they are irregular. 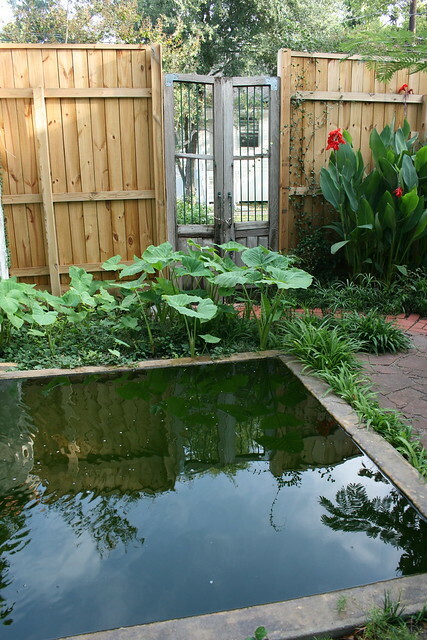 Using substrate in your Koi pond is not necessary, although it’s always an option. Traditionally, many Koi breeders use mud as substrate, as this improves spawning conditions and allows the fish to dig around for food as they naturally would. The downside to this is that you won’t see your Koi much: the water can get very cloudy! Although Koi will eat almost any plant they find, you can still keep them in a planted pond by placing some plants like marsh marigolds at the edges (as pictured to the right) or in your bog filter. This will give a beautiful effect and, most importantly, improve your water quality because plants will feed off nitrates in the water if the roots have access to the pond. Winter months are the most difficult time of the year for any pond fish and allowing your fish pond to fully freeze over can cause some problems. If the pond is not deep enough, the Koi fish will have to tolerate water temperatures outside of their comfort zone and may even become trapped as the ice gets too thick. All Koi fish ponds should be at least 4 feet deep, this allows the fish to go to the bottom of the pond where the temperature will be slightly higher than the upper levels. Be sure not to disturb the deeper layers of your pond during winter, as this will mix the warm and cold water and rob your fish of their safe place! 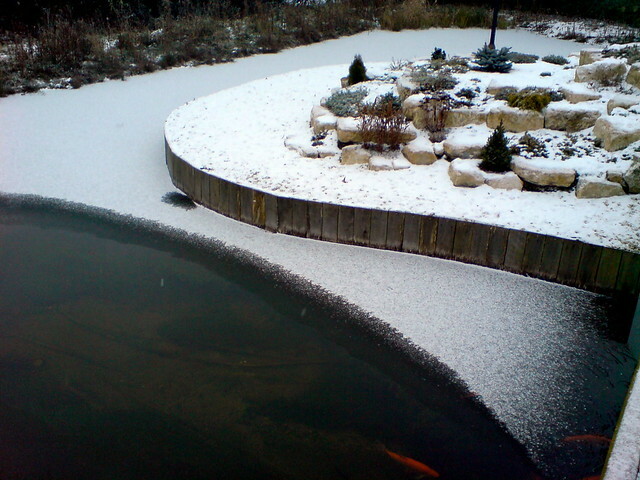 A full layer of ice over the pond for extended periods of time can trap toxic gases which may affect the health of the fish. A pond de-icer is a good investment; these will not keep all of the pond ice free but it will leave one area open, allowing the gases to escape and oxygen to enter. Feeding Koi may seem a bit daunting when you first research this subject but to simplify matters, their eating habits change throughout the year and this is mostly dependent on the water temperature of the fish pond. During fall, Koi should be fed wheat germ pellets that are high in carbohydrates and low in protein. Vegetable matter can also be supplied by offering them lettuce or even cabbage. During the winter months Koi are largely inactive and will not require feeding. As the temperature increases in the spring, the water temperature will rise and feedings should gradually be increased to at least once per day, the foods at this time of year should consist of Koi pellets that have a protein level of approximately 35% varied with vegetables. The temperature will continue to rise up to the summer months so the feeds should gradually increase until the fish are at their most active. Now the Koi will be constantly hungry and very active and their metabolism will be at its highest. High protein foods are now required by the fish. Fresh vegetables and meaty foods such as shrimp can be offered besides normal pellets. Often during the summer months it may be required to feed the fish 3-4 times per day. They can digest their food very quickly, hence the constant hunger. I have seen keepers throw a whole cabbage into the pond and the Koi carp attacking it like a shoal of Piranhas! If the fish are fed correctly through the year there should be no problems with them surviving the winter months ready for the start of a new year. When using commercial Koi pellet food, always make sure that they are high quality and not expired. If you have any more questions about pond and Koi keeping or want to share your own experiences with these beautiful fish, be sure to leave a comment below. Happy fishkeeping! Very nice article. I rescue animals and had adopted a few goldfish in dire need of homes. Then I noticed my new goldfish had barbells… Because they are koi! I have a half acre pond, but my husband and I are certain they wouldn’t survive in there. They are just too flashy. It’s been 5 years now, and they are all HUGE! They live indoors which I don’t recommend to anyone that doesn’t have the utmost commitment to their fish. They have outgrown their 640 gallon tank, which gets frequent water changes and I have to test and treat the water 2 or more times a week. I recently found this site and I love that the author(s) are thorough and contientous. If you ever consider expanding your koi caresheet, feel free to email me. I would love to help fill in the blanks, and dispel some of the myths that fish stores perpetuate. Oh dear, that must have been quite a shock to find out they were koi! I’m glad to hear you liked the article. What are you moving the fish to now that they’ve outgrown their current tank? As an enthusiast but not a keeper, love the article! There is so much invisible maintenance and hard work (year-round) behind these beautiful ponds and fish. Glad you like it, you’re definitely right! This article doesn’t even scratch the surface but hopefully it gives people an overview of what it takes to maintain a healthy koi pond.